The Periotest technique involves electronically controlled and reproducible percussion of tooth produced by the propulsion coil. The measuring coil ensures the velocity of the tapping head is constant at 0.2 m/s by compensating friction and gravitation. The 'Periotest value' is calculated from the signal of the accelerometer. 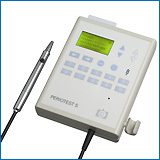 The Periotest measures the reaction to a reproducible impact applied to the tooth crown. The elastic and viscous properties of the periodontium and the surrounding bony tooth socket are to a large extent non-linear. The visco-elastic properties of a healthy tooth enabling the percussion of the Periotest tapping head to be decelerated in less than 1 ms are largely lost in periodontitis. It is this essential difference which the Periotest method utilizes. This microcomputerized measuring, steering and speech synthesis systems allows it to quantify in a numeric scale the elasticity of the tissue-implant binomium. The point of percussion in routine applications using the standard technique is the centre of the facial surface of the anatomical (not the clinical) crown. YOUR COMMENTS, CRITICAL REMARKS OR SUGGESTIONS ARE VERY HELPFUL!